Heat the broth to a simmer in a saucepan. Reduce the heat to keep the broth warm throughout the preparation. Over medium heat, in a large skillet heat the olive oil and 3 tablespoons butter until the butter is melted. Add the onion and a sprinkle of salt and gently cook until the onion is soft and translucent (about 5 – 6 minutes). Add the garlic and cook for an additional minute. Add the rice and stir to coat the rice well and, while stirring gently and constantly, cook for 7 – 8 minutes. (The experts tell me to do this until the rice is translucent on the ends. I never really saw this in the rice, but I found after about 8 minutes the rice was ready.) And don’t let the rice brown. Add the wine (the wine should sizzle when it’s added) and cook while stirring, deglazing the pan as you go, until the wine is completely absorbed, about 2 minutes. While stirring constantly, add one ladle (about 1/2 cup) of the warm broth, and keep stirring until the broth is absorbed. Keep repeating the process. Make sure you wait until the broth is absorbed each time before adding the next ladle of broth. The total cooking time should be about 30 minutes and at the end of it the rice should be cooked but still slightly chewy. You may need additional broth. The key is to keep stirring the rice throughout the process; stirring releases the starch molecules. Once the rice has reached the right degree of doneness, remove the pan from the heat. Cover the pan, and let it sit for about 5 minutes. Meanwhile, cook the peas. If you have a microwave, you can just place them in some water and cook for about 3 minutes. Don’t overcook them. Drain before adding them to the risotto. Add 2 tablespoons cold butter to the risotto and stir hard and vigorously until the butter is melted and the risotto is creamy. Fold in the parmesan cheese and peas. Hostess Hints: Do all of your prep before you start. 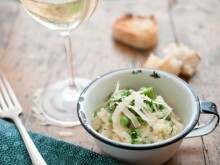 Dice the onion and garlic, open a bottle of wine, grate the cheese, and cook the peas. That way you can just add the ingredients to the pan and not interrupt the cooking of the risotto.